Darren Naish: Tetrapod Zoology: Pterosaur wings: broad-chord, narrow-chord, both, in-between, or…. all of the above? Pterosaur wings: broad-chord, narrow-chord, both, in-between, or…. all of the above? What did pterosaurs look like when they were alive? Did they have relatively broad wing membranes [patagia from hereon] that - like those of most bats - stretched as far as their ankles, or did they have narrow patagia that attached to their hips, or perhaps to the tops of their thighs? Until the 1980s, pterosaurs were pretty much universally depicted as possessing broad-chord wings that extended to their ankles. There were exceptions: K. A. von Zittel (1882) imagined pterosaurs as possessing narrow, swallow-like wings that did not attach further distally than the knee, and Harry Seeley (1901) opined that the patagia may not have incorporated the hindlimbs at all. But, mostly, pterosaurs were regarded as bat-winged, an image that Kevin Padian (1987) argued to be primarily typological (viz, pterosaurs were initially imagined as bat-like, therefore they must have had bat-like patagia). It’s well known that, following his studies of Dimorphodon and other pterosaurs, Padian championed the idea that pterosaurs were agile cursorial bipeds, and that their patagia were narrow and did not incorporate the hindlimbs (Padian 1983). This idea was popular for a while but, judging from the way pterosaurs are depicted today, it doesn’t seem that popular now (though this isn’t to say that there aren’t scientists and artists who are reconstructing pterosaurs in this manner). If anything seems popular, it’s actually a sort of hybrid morphology: while the patagia are ordinarily depicted as incorporating the hindlimb, they aren’t shown as extending as far as the ankle, but to the knee or shin. This goes for all of John Sibbick’s pterosaurs (in Wellnhofer 1991 and elsewhere) as well as for many other popular life restorations. I’ll admit that my personal aesthetic sense of what is, and what is not, cool leads me to intuitively prefer the narrow-chord model, and as a teenage enthusiast self-teaching myself from the writings of Bob Bakker and Greg Paul I personally took a liking to narrow-chord wings. But being a scientist is all about going where the evidence leads, and not on what you might intuitively prefer. Where does the evidence lead: did pterosaurs have broad-chord or narrow-chord wings? Or both? Having considered this matter in some depth (Naish & Martill 2003), and having looked at some of the pertinent specimens, I conclude that broad-chord patagia are best supported, and in fact are well supported. So, yes, the data best supports inclusion of the hindlimbs in the patagia, and extension of the patagia as far distally as the ankle. Shock horror: that’s a pretty controversial point of view in the world of pterosaur research. But quite a few specimens show this to have been the case. Let’s look at some of them. 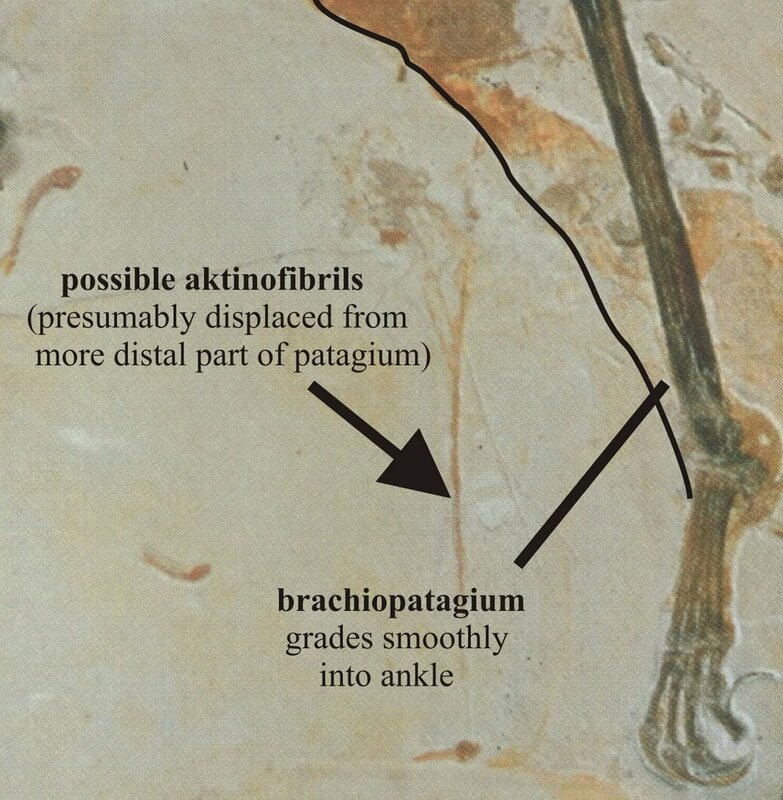 -- The famous ‘dark wing’ Rhamphorhynchus specimen preserves intact, in-situ patagia, and the left brachiopatagium ‘curves caudomedially and attaches to the ankle of the left hindlimb’ (Frey et al. 2003, p. 243). This is clearly visible in good photos of the specimen and there is no question that the patagia are genuine, intact and preserved in-situ. I have access to an excellent cast of this three-dimensional specimen and am happy with Frey et al.’s interpretation. -- The Eudimorphodon specimen MCSNB 8950 has patagia preserved adjacent to the ankles of both legs. 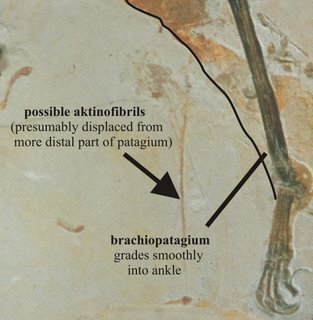 Fibres preserved within the membranes appear to confirm brachiopatagia attaching as far distally as the ankle, and the presence of a cruropatagium (Bakhurina & Unwin 2003). -- The holotype of little Sordes pilosus indisputably preserves brachiopatagia that attach to the ankles (Unwin & Bakhurina 1994). Claims that the patagial margins preserved in the fossil actually represent cracks are utterly unconvincing. While the interpretations given above have been challenged for some of these specimens (Peters 1995, 2001), I note the following: ALL the pterosaur specimens for which we have patagia appear to show broad-chord patagia and, while in some of these cases the broad-chord interpretation is ambiguous or arguable, there are NO specimens that unambiguously preserve narrow-chord patagia. Claims that narrow-chord membranes, unattached to the distal hindlimb or even unattached to the hindlimb altogether, are preserved in some specimens (e.g. the anurognathid Jeholopterus and the Zittel wing Rhamphorhynchus) are either based on data that is even more ambiguous than that discussed above, or are erroneous (e.g. the Zittel wing can’t be used to demonstrate lack of attachment to the hindlimb, as the caudolateral part of the membrane is missing and we don’t know how extensive the membrane was when complete). Data from pterosaur hindlimb proportions provides support for the idea that the hindlimbs were incorporated into the patagia. By plotting the lengths of femora, tibiae and metatarsi onto ternary diagrams, Daniel Elvidge and David Unwin found that pterosaurs occupied a tight, compact group of data points within morphospace, and a ‘data cloud’ similar in size to that occupied by bats. The cloud occupied by birds was more than twice the size of the pterosaur or bat clouds (Elvidge & Unwin 2001). This data indicates that pterosaurs were constrained in hindlimb proportions in the same manner that bats are. I find the most plausible explanation for this to be the linking of the fore- and hindlimbs by patagia: because pterosaur hindlimbs were always a part of the wing apparatus, pterosaurs did not evolve the diverse hindlimb morphology that birds did. Significantly (from the point of view of the discussion here), those pterosaur specimens preserved with patagia were distributed randomly within the pterosaur cloud. This indicates that broad-chord patagia are both widely distributed within pterosaurs, and the norm for the group. Dyke et al. (2006) have recently argued that broad-chord patagia may not have applied to all pterosaurs, but they seemed unaware that there is evidence for this morphology outside of Sordes. I still think it’s at least possible that some pterosaurs had reduced patagia however. Morphological evidence suggests that dsungaripterids were quite terrestrial in habits (Fastnacht 2005), and it’s tempting to speculate that they were better suited for walking around on the ground than were others, and hence with less extensive patagia. But, hey, this is part of the reason why pterosaurs are so interesting: they’re unique, with no close extant analogues, and this is why they’re so controversial. The evidence we have shows that broad-chord patagia were widespread among pterosaur clades. Maybe there were narrow-chord forms (with my money being on dsungaripterids), but we have yet to find soft-tissue evidence demonstrating their presence. Bakhurina, N. N. & Unwin, D. M. 2003. Reconstructing the flight apparatus of Eudimorphodon. Rivista del Museo Civico di Scienze Naturali “Enrico Caffi” 22, 5-8. Elvidge, D. J. & Unwin, D. M. 2001. A morphometric analysis of the hind-limbs of pterosaurs. In Two Hundred Years of Pterosaurs, A Symposium on the Anatomy, Evolution, Palaeobiology and Environments of Mesozoic Flying Reptiles. Strata Série 1 11, 36. Fastnacht, M. 2005. The first dsungaripterid pterosaur from the Kimmeridgian of Germany and the biomechanics of pterosaur long bones. Acta Palaeontologica Polonica 50, 273-288. Frey, E., Tischlinger, H., Buchy, M.-C. & Martill, D. M. 2003. New specimens of Pterosauria (Reptilia) with soft parts with implications for pterosaurian anatomy and locomotion. In Buffetaut, E. & Mazin, J.-M. (eds) Evolution and Palaeobiology of Pterosaurs. Geological Society Special Publication 217. The Geological Society of London, pp. 233-266. Naish, D. & Martill, D. M. 2003. Pterosaurs – a successful invasion of prehistoric skies. Biologist 50, 213-216. Padian, K. 1983. A functional analysis of flying and walking in pterosaurs. Paleobiology 9, 218-239. - . 1987. The case of the bat-winged pterosaur: typological taxonomy and the influence of pictorial representation on scientific perception. In Czerkas, S. J. & Olson, E. C. (eds) Dinosaurs Past and Present Vol. II. Natural History Museum of Los Angeles County/University of Washington Press (Seattle and London), pp. 64-81. Peters, D. 1995. Wing shape in pterosaurs. Nature 374, 315-316. - . 2002. A new model for the evolution of the pterosaur wing – with a twist. Historical Biology 15, 277-301. Seeley, H. G. 1901. Dragons of the Air: An Account of Extinct Flying Reptiles. Methuen (London). Unwin, D. M. & Bakhurina, N. N. 1994. Sordes pilosus and the nature of the pterosaur flight apparatus. Nature 371, 62-64. Wellnhofer, P. 1991. The Illustrated Encyclopedia of Pterosaurs. Salamander Books (London). Zittel, K. A. von 1882. Über Flugsaurier aus dem lithographischen Schiefer Bayerns. Paläontographica 29, 47-80. On broad patagia hindering terrestriality, I don't know why but it made me remember a paper on Nature about vampire bats running on treadmils. Riskin, D.K., and J.W. Hermanson. 2005. Biomechanics: Independent evolution of running in vampire bats. Nature 434(March 17):292. http://dx.doi.org/10.1038/434292a. They were reasonably fast (0.6 m/s). The movie is impressive. Don't forget the Vienna *Pterodactylus* clearly shows a membrane which attaches to the mid thigh. This is, of course, still broader than many 'narrow wing' concepts and may still include a degree of post-morten contraction with muscle degredation etc, and therefore may have reached to the knee, but probably no further. The Munich *Pterodactylus* is less clear, but seems to show the same thing. Hazlehurst & Rayner (1991) also looked at aspect ratios in birds, bats and pterosaus and as with the study Darren mentions, finds that pterosaurs are relativley conservative in their wing-shape: even if the widest and narrowest possible wings are included. Yes, that's a pterosaur hind limb and yes, that's a membrane, but the damn thing is so scattered that the membrane could be a wing, not a uropatagium. Especially so since the membrane appears to continue on the other side of the limb and ordered parallel actinofibrils are associated with it. Please don't leave anonymous comments: attach your names to posts. Who said that the membrane of SMNK Pal 3830 is a uropatagium? The preserved membrane of SMNK Pal 3830 extends from a wing (preserved on the left of the slab) to a hindlimb (preserved on the right). It is therefore most reasonably interpreted as part of the cheiropatagium (not the uropatagium). Some people have complained about the fact that I only posted a cropped version of the image. I initially planned to post a full view of the image as well as the cropped version, but I couldn't get this to work (I sometimes have enormous problems in getting blogspot to accept my images). I decided that it didn't matter given that this specimen has already been so well figured in the literature. Oh well. What work has been done on attachment scars? Spots where tendons and ligiments connect with the bone. As I recall the idea that pterosaurs had an erect, bipedal stance came about from studies done on early specimen mountings. Studies in which it was discovered that mounting the skeletons as bat-like meant their hips were badly dislocated. What has changed in that department? Response to Alan: there are unfortunately no clues from bones as to where wing membranes might have been attached, as these structures don't have ligamentous attachments. The idea that pterosaurs had erect hindlimbs and were bipedal was predominantly based on the hindlimb and pelvis morphology of the Jurassic pterosaur Dimorphodon. It was argued that the sideways-facing hip sockets and inturned femoral heads permitted an erect stance, and that the hindlimbs were well suited for bipedal running. These assertions have not been supported by more recent interpretations and discoveries (sorry, don't have time to go into all the details). While pterosaurs seem to have been pretty proficient on the ground (and not helpless as used to be thought), morphological and trackway evidence indicates that they were quadrupedal, plantigrade, and lacking the features that would allow committed bipedality. Infrequent visitor, and sorry, haven't registered in a blog space. I can send you images of a digitigrade pterosaur track (anurognathid)from a 1964 paper, and models of digitigrade pterosaur feet (MSNB 8950, Pteranodon, Batrachognathus) that don't break any of Jim Clark's rules about bending at the metatarsophalangeal joint. Of course there's also Rotodactylus tracks that record pre-pterosaur (fenestrasaur) activity with a digitigrade track that has pedal digit V impressing far behind the others, sometimes quadrupedal, other times bipedal. Peters, D. 2000a. Description and Interpretation of Interphalangeal Lines in Tetrapods. - Ichnos 7(1): 11-41. Also can send images of the azhdarchide wing membrane noted in your blog with tracings "completing" the wing membrane detached from the wing and extending beneath the ankle. Send me an email address that I might send this evidence to you for comment. That way you can check it against the 'grain' of the aktinofibrils to see if there's a match.